Internet has transformed business relationships through the fusion of speed, efficiency, connectivity, innovation and art. These contemporary dynamics require web sites to be a direct communication link between the visitor and the organization. Once individual design is established, systems application development must tightly integrate the progressive nature of business information and customer relationships. Internet and ebusiness applications are simply information management. We develop customized software that compile and organize loose data. Ultimately, we simplify and optimize your proficiency and profitability. A client server application is a sharing tool capable of performing across a variety of networks. Our client server applications utilize internet connectivity and web browser interface--a fresh solution to integration with web technology. 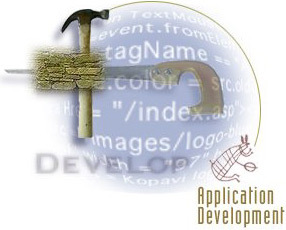 Applications development is the keystone for evolving business relationships.